What is a Computer Simulation and What does this Mean for Simulation Validation? Many questions about the fundamentals of some area take the form “What is …?” It does not come as a surprise then that, at the dawn of Western philosophy, Socrates asked the questions of what piety, courage, and justice are. Nor is it a wonder that the philosophical preoccupation with computer simulations centered, among other things, about the question of what computer simulations are. Very often, this question has been answered by stating that computer simulation is a species of a well-known method, e.g., experimentation. Other answers claim at least a close relationship between computer simulation and another method. In any case, correct answers to the question of what a computer simulation is should help us to better understand what validation of simulations is. 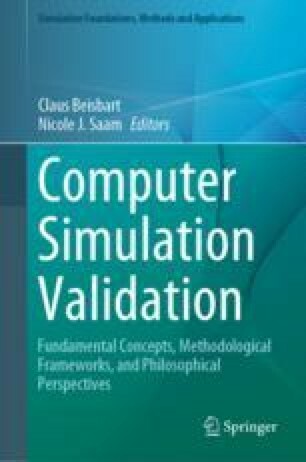 The aim of this chapter is to discuss the most important proposals to understand computer simulation in terms of another method and to trace consequences for validation. Although it has sometimes been claimed that computer simulations are experiments, there are strong reasons to reject this view. A more appropriate proposal is to say that computer simulations often model experiments. This implies that the simulation scientists should to some extent imitate the validation of an experiment. But the validation of computer simulations turns out to be more comprehensive. Computer simulations have also been conceptualized as thought experiments or close cousins of the latter. This seems true, but not very telling since thought experiments are not a standard method and since it is controversial how they contribute to our acquisition of knowledge. I thus consider a specific view on thought experiments to make some progress on understanding simulations and their validation. There is finally a close connection between computer simulation and modeling, and it can be shown that the validation of a computer simulation is the validation of a specific model, which may either be thought to be mathematical or fictional. I’m grateful to Julie Jebeile and Nicole J. Saam for useful comments and criticism. Brown, J. R., & Fehige, Y. (2017). Thought experiments. In E. N. Zalta (Ed. ), The stanford encyclopedia of philosophy (Summer 2017 Edition). https://plato.stanford.edu/archives/sum2017/entries/thought-experiment/. Franklin, A., & Perovic, S. (2016). Experiment in physics. In E. N. Zalta (Ed. ), The stanford encyclopedia of philosophy (Winter 2016 Edition). https://plato.stanford.edu/archives/win2016/entries/physics-experiment/. Frigg, R., & Hartmann, S. (2017). Models in science. In E. N. Zalta (Ed. ), The stanford encyclopedia of philosophy (Spring 2017 Edition). https://plato.stanford.edu/archives/spr2017/entries/models-science/. Gupta, A. (2015). Definitions. In E. N. Zalta (Ed. ), The stanford encyclopedia of philosophy (Summer 2015 Edition). https://plato.stanford.edu/archives/sum2015/entries/definitions/.